2007; 324 pages. Book #4 (out of 6 now) in Konrath's Jacqueline 'Jack' Daniels series. Genre : Psycho-killer thriller. Overall Rating : B.
Chicago cuisine is to die for. Literally, because someone calling himself 'The Chemist' is poisoning food in all sorts of restaurants and supermarkets. The Chicago Police Department tries to keep things calm by not announcing all the deaths. They appoint our hero, Detective Jacqueline Daniels, to head the crime team, and give her two choices. Solve it and be a hero; don't solve it and be demoted to traffic cop. The story is formulaic, but it works. A smug, psychotic killer committing gruesome murders as part of a larger plan; eventually taking on Jack herself. In the meantime, anyone knowing Jack is also a target, including her BF Latham, who seems to end up in IC in every book. The action is non-stop. The humor will make you chuckle - especially the repartee between Jackie and her former partner, Harry McGlade. You gotta love any bad guy who goes by the moniker "The Chemist". 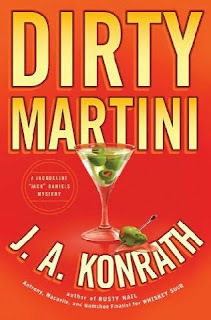 OTOH, Dirty Martini is the polar opposite of a police procedural story. Clues are routinely ignored, so don't try to solve the case alongside Jack. The Chemist brazenly invades two precinct houses to destroy old records, and the cops somehow don't find that worth looking into. When he releases thousands of cockroaches into a police station, no one stops to ask themselves why. The case-cracking clue comes out of nowhere, and with no explanation as to why the normally meticulously cautious Chemist suddenly gets sloppy. Read this book for what it is - a page-turner. Turn off the analytical half of your brain and enjoy a story with a strong female lead (with more lives than a cat) and lots of thrills, spills, and chuckles. Ignore the implausibilities and rejoice in the fact that in the end, Jackie won't be directing traffic. Konrath isn't trying to give you a feel for what it's like to be a police detective; he just wants to entertain you for a few hours. He gets a "B" from me for his efforts. Despite several dozen people dying in a variety of ways, not one drop of blood is spilled in Dirty Martini. This is a pleasant change-of-pace from the previous book in this series. After Book #3, Rusty Nail, Konrath went on a 3-month promotion tour, visiting 600+ bookstores in 27 states and driving more than 13,500 miles. He met over 1100 booksellers, and takes time at the end of Dirty Martini to thank them all by name. Kewlness. Finally, if you read the hyping blurbs in the front of this book (OCD readers do), you will note that two of them are David Ellis and Jim Munchel. By strange coincidence, one of the characters in Dirty Martini is named Davy Ellis, and one of the characters in the sneak-preview of Book #5 (Fuzzy Navel) at the end of Dirty Martini is named Jim Munchel. So be sure to write Konrath and let him know how much you enjoy his books. You just might end up seeing your name in the 7th book in this series. I've never heard of the psycho killer thriller genre - good one. Is this series at all Plumish? very similar to the Plum series as far as humor and romance go. but Daniels is a veteran detective, and in the two Plum books i read (#1 & #2), Stephanie was still learning the ropes. also, Konrath is more gorier than Evanovich. if the violence won't faze you, i think you'll enjoy making Ms. Daniels' acquaintance.